After the fail of my first loaf of bread didn't go quite to plan and didn't cook properly, I thought I'd try again with a recipe from Jo Wheatley. I thought this would be a good idea as so far all her recipes have worked out. I actually found the kneading of the dough really relaxing so it wasn't like hard work. And then the fact that it turned out well and tasted delicious was a bonus! Tip all the dry ingredients into a bowl and make a well in the centre. Heat the milk and water together until lukewarm. Add the melted butter and stir to combine. If using a machine with a bread hook, combine the ingredients with a slow to medium speed until the dough comes together. If mixing by hand, use a wooden spoon or spatula. Continue to knead the dough for 7 minutes in the machine or for 10-12 minutes by hand until you have a smooth elastic dough. 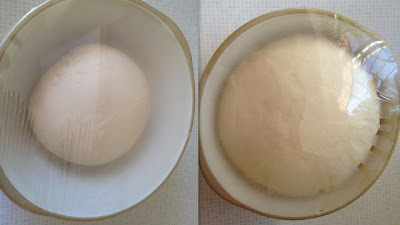 Shape the dough into a ball and place in a large, lightly oiled bowl. Cover with clingfilm and leave in a warm place for about an hour or until it's doubled in size. Tip the dough out onto a lightly floured surface and knead for 1 minute to knock back the dough. Mould it into a sausage shape and pop it into a greased 900g (2lb) loaf tin. Cover it with oiled cling film and leave to prove for 40-60 minutes until the dough has doubled and feels springy. Preheat the oven to 200oC/400oF/Gas Mark 6. If you choose to, gently brush the top of the loaf with egg and bake for 30 minutes. I noticed halfway through that it was looking very golden on top so I covered it with foil to stop it from burning. The loaf will be done when golden brown and the underside sounds hollow when tapped. Cool the loaf for 10 minutes in its tin and then transfer to a wire wrack to cool completely. Leave until cold before slicing.